Welcome to the Winter Toy Shop! The holiday season has arrived and the toymaker is busy finishing off his latest creations! Outside, children ski and snowboard, and a freshly built snowman sparkles in the light that shines from the toyshop tower. Help decorate the huge tree that stands at the center of the square, play with the curious kitten on the cozy wooden bench or join in with the carolers beneath the ornate streetlamp. This charming set also features a ladder, trees in various sizes, jack-in-the-box, a toy biplane, helicopter, rocket, train, race car, truck, robot, tugboat, teddy bear and a wrapped gift. Have fun building this enchanting winter wonderland! 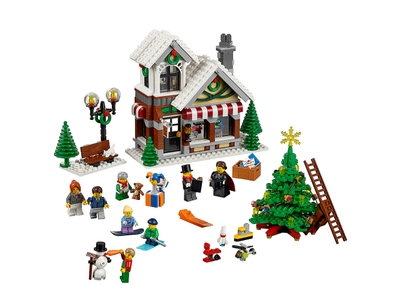 Includes a snowman and 8 minifigures with assorted accessories: a male caroler, female caroler, a woman, 2 men, 2 boys and a girl. Price is 87% above the initial Lego retail price! This comes down to 16.70 cent per brick. The Winter Toy Shop (10249) Lego set is no longer directly available from the sites below. However, 3rd party partners of these sites might still have the set available. Alternate description Enjoy festive family fun building the Winter Toy Shop, with Christmas tree, toys, gifts, streetlight, bench, 8 minifigures and a snowman. Gather the family for some festive LEGO® building fun! Light up the toyshop tower with the LEGO® light brick! Enjoy the holiday season with this fun, festive model!